High Efficiency Gas Furnace - Is A High Efficiency Gas Furnace Worth The Expense? Is A High Efficiency Gas Furnace Worth The Expense? When the time comes for you to replace your old gas furnace will you be looking at a high efficiency gas furnace to replace your existing one? Do you even know what a high efficiency gas furnace is? Have you ever heard of AFUE? If you’re looking at gas furnace reviews you’ll learn more about this important measurement of energy efficiency. However, to answer the above question, only a prospective buyer looking for the highest efficiency in a gas furnace will know how to respond after considering its benefits. Annual Fuel Utilization Efficiency (AFUE) is a guideline set forth by the US Department of Energy. According to furnace experts, the AFUE “attempts to represent the actual, season-long, average efficiency of that piece of equipment, including the operating transients”. What this means for the homeowner is a much more accurate picture of operating costs when installing a gas furnace. If your present gas furnace is at least fifteen years old the AFUE is likely around 65%. If you’re looking for the best gas furnace for your home you should start with an AFUE of at least 90%. Most manufacturers such as Trane, Goodman, Lennox and Rheem gas furnaces offer units with at least a 90% AFUE, some higher. If you’re thinking of installing a high efficiency gas furnace, consider that experts agree that over-sizing a unit results in more cycling off which results in a loss of efficiency. There are calculations, such as ACCA that homeowners and installers can use to determine the best gas furnace size for your home. Get a reputable contractor to help you through this. 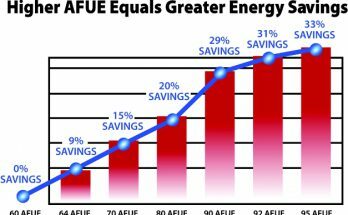 Goodman gas furnaces come in Standard Efficiency models with 80% AFUE and High Efficiency models with 95% AFUE. Experts also say that if you live in a milder climate, an 80% AFUE model should be fine. It’s likely that the old gas furnace you are replacing has an AFUE of only 65%, so you’ll definitely notice a difference with a high efficiency gas furnace running at 80% AFUE. Look into a furnace that offers a multi-stage system. These two and three stage gas furnaces use variable speed blowers which help to maintain a more constant temperature. They bring the air up to temperature before they start blowing it into the house making the initial cold blasts of air from your old unit a thing of the past. Rheem gas furnaces also offers a wide range of high efficiency gas furnaces. Their Prestige Series offers control up-flow, control down-flow and control horizontal gas furnaces, all of which have an Energy Star Rating. Trane offers the XC three stage variable speed unit, the XV two stage variable speed unit and the XT single stage gas furnace as well as other models. The XC95 has a 95% AFUE, and the XV95 has an impressive AFUE rating of 96.7%. Is a high efficiency gas furnace worth the expense? There are too many options available to answer with a quick yes or no. A few efficiency points added to millions of home furnaces would result in a large cumulative cutback in greenhouse emissions, but is it worth that outcome to discard millions of perfectly good furnaces, taking a chance on newer technology? Only you can answer that question. It is said that average US homes lose more than a quarter of their heating energy through leaky ductwork and that poor sealing of ducts can also promote discomfort and in some cases even cause back-drafting of gas-fired equipment. Ductwork should be inspected and sealed in conjunction with furnace installation. Get three competitive bids and ask each bidder for an estimate for a budget system of high reliability, and another bid for a high efficiency unit. Request detailed items and ask that the AFUE rate be included. Choose a high bid and a low bid and determine the cost difference between them. Is it hundreds or thousands? OEM furnace makers usually supply guidance on cost savings; check their web sites. Do a projection of annual fuel savings of the high-efficiency model and compare it with a low-end model. Even though the budget model might do substantially better than what you have now, use your actual fuel consumption for a conservative baseline. Ask a reputable contractor to help you with the calculation of the incremental annual savings of the high-end system. 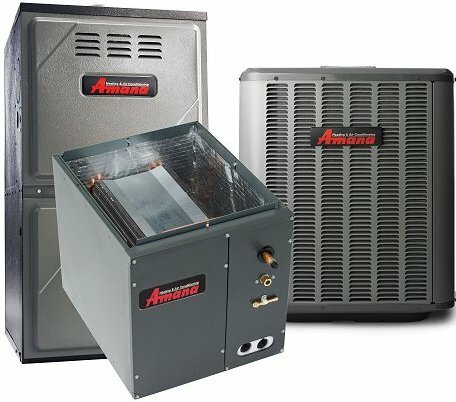 With a high efficiency gas furnace you have significant savings on utility bills, quiet operation, and improved indoor air quality. By reducing your energy consumption, efficient home heating systems also reduce pollution and protect the earth from the effects of global warming. With a standard furnace function, when the temperature in the home falls below a certain level, the pilot light automatically ignites to heat a burner, which utilizes some form of gas to generate heat within a combustion chamber inside the furnace. The heat passes into a heat exchanger where the air is heated and blown through a series of ducts to heat the house. Exhaust fumes exit the furnace through a gas flue or chimney. With a high efficiency furnace function, there is a second combustion chamber capturing gases before it exits into the flue. 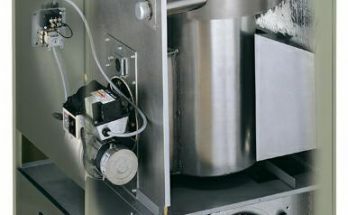 This second chamber condenses the gaseous by-products to form a liquid, and extracts any remaining heat, which is then transferred into a second heat exchanger and helps to heat the air. The small amount of waste passes through a small flue or pipe in the wall. Contribute to cost saving and leave your furnace off during unoccupied hours. Use a setback thermostat to minimize unnecessary use of the furnace. Efficient furnaces don’t need to operate for as many hours to provide the required heat. What this means is that time when flames are present are reduced. This has been noted by insurance companies as a benefit in terms of improved fire safety. If you are keen on a high efficiency gas furnace not only for its cost saving benefits, but also its contribution to a cleaner environment, if the investment pays for itself in five to ten years you have got your money back, and nothing to lose. Buying a New Gas Furnace? High Efficiency Worth The Expense? Copyright © 2019 Gas Furnace Reviews.